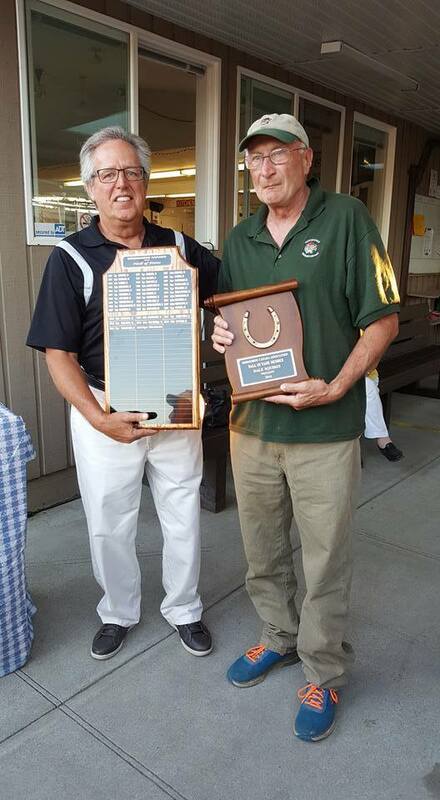 Dale Squires received recognition for all his dedication to horseshoes and is now a member of the Hall of Fame Horseshoes Canada. Hall of Fame Inductee Speech August 20, 2016 delivered by Mike Holley, Chairperson, Horseshoe Canada Hall of Fame. Ladies and gentlemen, it gives me great pleasure and enormous pride to be involved as the Chairperson of the Horseshoe Canada Hall of Fame. Every year I am reminded of just how auspicious this organization is and how much we need to appreciate those that have come before us. Keeping that in mind, I want to introduce the members of the Horseshoe Canada Hall of Fame in attendance this evening: for 2002 from Quebec, Sylvianne Moisan; for 2003 from Quebec, Andre Leclerc; for 2005 from Ontario, Sheila Leis; for 2007 from British Columbia, Dorothy Butts; for 2010 from Alberta, Dianne Beck; for 2012 from Saskatchewan, Colin Finnie. To introduce this year’s inductee to the Horseshoe Canada Hall of Fame Builders, Organizer and Promoter award, you need to keep in mind that this individual doesn’t need to be in the limelight or the foreground and just because you don’t notice someone, doesn’t mean they aren’t deserving of this award. This individual, when they aren’t dealing with things at a club or provincial level, can be found building courts, getting sponsors or doing backroom deals to make sure that the funding and money flows in the right direction; back to Horseshoe Canada. This person has worked tirelessly in the promotion and administration of a major multi-provincial tournament. When it comes to the Horseshoe Canada Canadian championships, they can be found doing all manner of jobs, coaching the peewees, judging, keeping score, putting out fires and dealing with all manner of emergencies. They have been a curler, volunteer, coach, organizer and mentor. In 2000, this individual received national recognition by being awarded the Sharon Ellison Award in honour of his contribution to the sport of horseshoes. Ladies and gentlemen, let me introduce to you this year’s inductee to the Horseshoe Canada Hall of Fame in the Builder, Organizer and Promoter category: Dale Squires.